Have you always wanted to be relieved from the pain of waxing and the cuts from shaving? I regret to inform you that you will just have to bare with it. The Derma Seta does not always work. It does sometimes, but I wouldn’t exactly call it ‘reliable’. 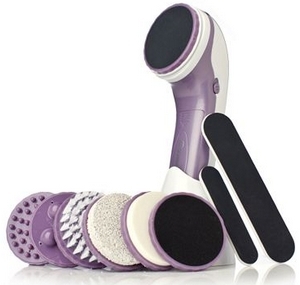 The Derma Seta is meant to be a hair removal device which is a hair removing buffer pad gone electrical. It is advertised to work on all larger areas of hair, including a mans chest. The only time this works is if you change the pad every so often as it loses its roughness really really quicly. But wait, there are still wonderful uses for the derma seta. There is a reason why I didn’t send it back. I bought the Deluxe version which is rechargeable. The basic package is the same thing but you have to get your own batteries. Another difference between the two is that the deluxe has two speed settings. The Derma Seta comes with a number of attachments. Lets discuss the buffing pads. This is supposed to be and easy and cost effective way to remove hair quickly from legs, arms and other large areas. It has a fine grit so it exfoliates the skin and the same time as removing the hair. With one buffing pad, I can buff maybe one large patch on my leg. I can’t do a lot with one buffer pad. I think I used up all my replacements just to do both my legs. There were 5 replacements. So its not exactly cost effective. It is a loud machine. The whole house can hear if you’re using it. And it is an annoying sound. You won’t feel motivated to use this product. First of all, I must say that I haven’t used the Bikini Line Hair Remover, the Facial hair remover, the Micro Massaging Module and the Micro Massaging Module. The first two don’t work and the massage modules are useless to me. It is meant to be good for cellulite, but I don’t believe how it would work. My favourite attachment is the deep cleansing brush. It is a great tool for exfoliation on the face. I use it with a good foaming facial wash. It leaves the skin feeling clean and smooth. Probably not as good as like a clairasonic or something but, just for a general deep facial cleans, its awesome. It really good at removing make-up and getting in those pores. In the shower, I use the pumice stone and the foot smoother to avoid the hardness from forming around my heel. It leaves the feet feeling as soft as baby's skin. It does the work s effectively, efficiently and fast. You will be impressed with the result. and you won’t need to keep going out and paying for a pedicure. Especially when you have issues with feet like I do. Yuck and Blechhhh!! The body buffer is pretty cool. I put some moisturizer on it and buff it into my skin so it is better unsorbed rather than looking greasy. Its something that should be used by everyone. But not on faces. Buying the rechargeable one gave me more motivation to use it. I never have to worry about the battery running out and buying new ones. Too much hassle. I don’t even know what a good brand of batteries are. It is an affordable gadget, so if you want one. Go for it, but it is more of a pedicure kit than hair removal. Not To Buy: as a hair removal gadget. This blog was very good . I gathered many information but can you suggest me more information about Laser Hair Removal. is it remove from root?